Sumptuous food FOR PARTIES AND EVENTS or BUFFETS AND DELICIOUS DISHES DELIVERED TO YOUR HOME FOR SPECIAL OCCASIONS. There’s nothing quite like organising an exciting event or throwing a great party. Catering can play such a large role so why not let us take care of it for you? Our huge and varied menus have something to suit most occasions. From stylish and tasty finger food to grand spreads of several courses, you’re also most welcome to request any favourites. We’re also very happy to work with any themes you might be planning. Our flexible service options give you a wealth of choice – your event, your way. We can cater in open fields, tents, offices and homes . . . wherever you need us to be. Experienced and attentive, our team are great people to have around on the day, really helping to make the event run smoothly. View a small selection of our food options below, or over on our menus page, and don’t hesitate to get in touch for a full menu. Begin with some of our imaginative canapés. Enjoy delicious Thai prawn or Moroccan basted beef skewers, small pastries filled with smoked mushrooms and creme fraiche, mini eggs benedicts with quails eggs and fresh hollandaise sauce, or perhaps a platter of fresh oysters au natural for your guests to try? Fine cured meats and an array of cheeses, home marinated grilled vegetables, burrata and balsamic figs, and brushcetta. Or how about sides of home smoked salmon, marinated prawns and some fresh Scottish seafood? When it comes to our platters the world is your oyster. 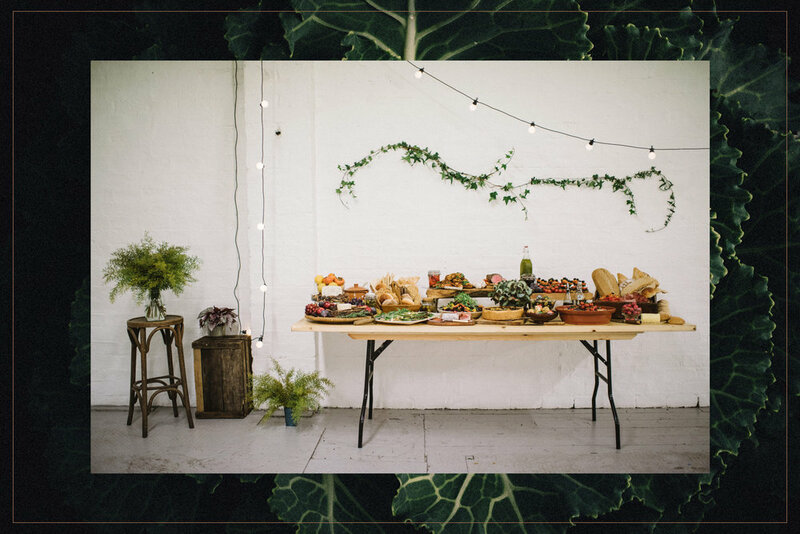 We can hand around a few tasty morsels or lay up an extravagant feast for your guests to graze on at their leisure. Why not add some of our colourful fresh salads, made using the finest seasonal ingredients. Classic Greek, east meets west orzo; pear and blue cheese with toasted pecans; pearl barley, beetroot and roast carrot; and chilli and coriander or lime carrots and poppy seeds to name but a few. Or how about a Moroccan feast? – Beef, lamb or chicken cooked on the bone in fresh ginger, garlic and North African spices. Roast spiced sweet potatoes with burnt yoghurt dressing and warm fragrant couscous, homemade hummus and flat breads. Tagines and curries, seafood chowders and stews. . the options here are fairly unlimited - We can either hand around interesting tasty dishes to your guests in bowls or set up a stand, street food style. A great way to feed a large crowd! We can of course make you something more traditional, such as roast beef or pork with all the trimmings, bread sauce, rich gravy, fresh buttered vegetables, roast potatoes and Yorkshire puddings. Or a rich steak pie with crisp pastry - sometimes the classics are best!